Combine all spices and seasonings in a small bowl. Place lamb cubes in a shallow baking dish or large bowl. Rub spice mixture into lamb with hands. Let sit till lamb is room temperature and spices have permeated lamb, appx. 30 minutes to an hour. Cut 2 red peppers into chunks and 2 small onions into wedges. Mix oil and lemon juice and toss with vegetables. Season with salt and pepper. Preheat a grill or grill pan to high heat. 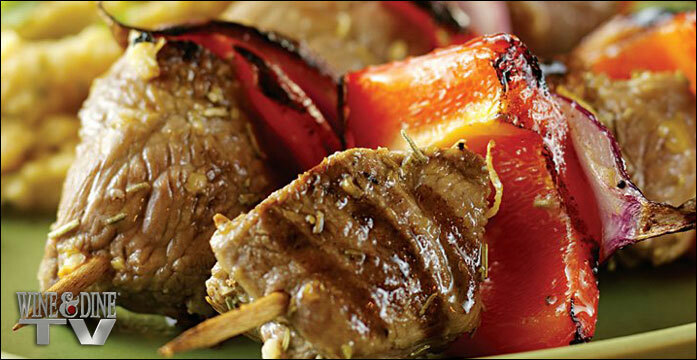 Thread lamb cubes onto skewers alternating with chunks of red onion and red bell pepper, without crowding skewer. Grill kabobs for 3 minutes per side. or until cooked to desired doneness. Transfer to a serving platter, and serve over couscous.